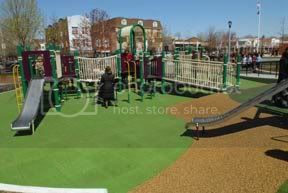 Gravesend Park is a child-friendly recreation area located in Brooklyn, NY. The park is found on 18th avenue and 56th street in the Borough Park region of Brooklyn. The park offers a playground with swings and spray showers for the younger generation as well as game tables and benches for the older. The park contains an array of facilities such as Baseball Fields, Public Restrooms, Handball and Basketball Courts. Gravesend Park is a place for school field trips, summer day camps and community gatherings. The park is geared to attract families and senior citizens with its greenery and newly renovated gardening sites.